There's evidence the first Olympic athletes ate cheesecake, but it probably looked a lot different than this. It turns out to be easier to find out when and where the original Olympic Games were held (776 BC, in Olympia, Greece) than to nail down the story behind National Cheesecake Day. Yes, in case it had passed you by, today is National Cheesecake Day. Here at The Salt, we first learned about it last Tuesday, when a large, chilled, many-layered cheesecake turned up at our HQ in Washington, D.C. We couldn't resist doing a bit of research (or eating for that matter) and a little web browsing soon revealed that National Cheesecake Day is listed as a Food Holiday on several web calendars, and does, indeed, fall on July 30. But trawling these calendars also reveals that someone, somewhere has designated just about every single day, week and month of the year as a national food holiday of some kind. There's National Crabmeat Day (March 9), National Pineapple Upside-down Cake Day (April 20) and National Deviled Egg Day (Nov. 2). In fact, there are so many food holidays that they often have to double up. National Pickle Day ( Nov. 14), for example, coincides with National Spicy Guacamole Day; and May is not only National Barbecue Month, but also National Chocolate Custard Month. Now, a few of these food holidays are, indeed, as "official" as, say Thanksgiving. Back in 1982, for example, Congress requested the President designate July as National Peach Month. "In recognition of the role peaches play in our food supply and our economy," Ronald Reagan was to ask the people of the United States "to incorporate this nutritious fruit into their diets, and call upon interested groups to celebrate this month with appropriate programs and activities." But most of these so called national food holidays turn out to be the invention of industry and other interest groups as a way to promote their products. Thanks to The National Hot Dog & Sausage Council, July is National Hot Dog Month, and you just missed National Hot Dog Day, July 23. 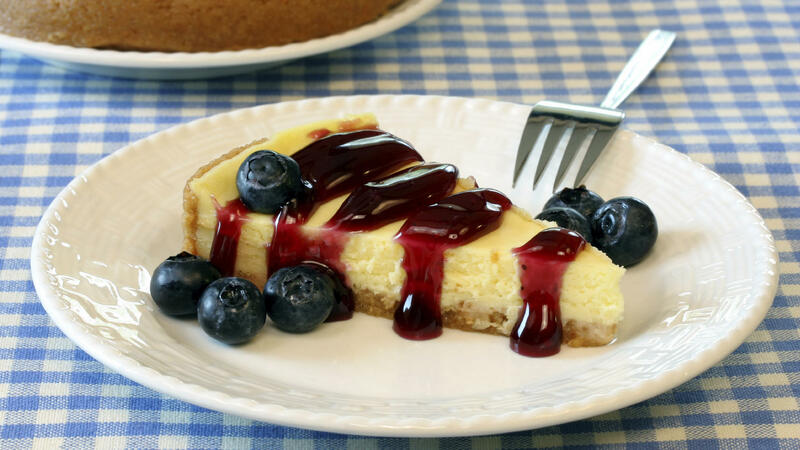 But when we turn to the likes of National Tapioca Pudding Day, and – in this case - National Cheesecake Day, it becomes difficult to track down the savvy pickler or pudding maker who first came up with this annual marketing event. And, in most cases, does it really matter? National Melba Toast Day and National Cheeseball Day have both come and gone without most of us noticing. But in the case of National Cheesecake Day, the tradition has gained some traction. Not least because the Cheesecake Factory chain and other producers of these uniquely unctuous slices of sweetness take the opportunity to mark the day with special discounts and new cheesecake creations. What's more, National Cheesecake Day has acquired offspring. There's a National Pumpkin Cheesecake Day on October 21, a National Blueberry Cheesecake Day on May 26, not to mention a National Cherry Cheesecake Day on April 23. Some years, including this one, National Cheesecake Day occurs during or close to the start of the Summer Olympics. And this usually inspires someone to observe that cheesecakes were eaten by athletes competing in the very first Olympics. Cheese was considered a good source of energy for athletes, and it was also an early convenience food – a great way of preserving milk and making it portable. The earliest written recipe for cheesecake to survive comes from the Greek grammarian Athenaeus, nearly a thousand years later, in 230 AD: "Take cheese and pound it till smooth and pasty; put cheese in a brazen sieve; add honey and spring wheat flour. Heat in one mass, cool, and serve." Whether cheesecake will feature prominently on the menu during this year's Olympics in London remains to be seen. Cheesecake is not something my compatriots regard as a proper British pudding (i.e. dessert) although the frozen version in a foil dish is now a mainstay of the supermarket freezer case. Maybe the British will be promoting something like Bakewell Tart or Sussex Pond Pudding instead.